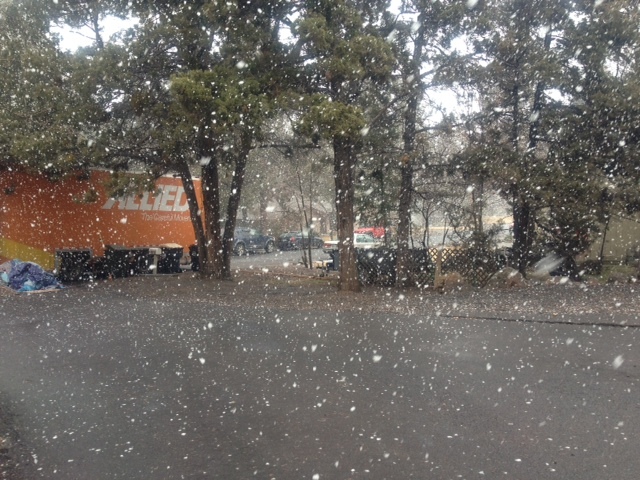 It was snowing on moving day. Snowflakes the size of quarters that melted soon after hitting the ground. I know it sounds horrible, but being a Southern Californian all my life, I laughed and kept unloading and unpacking. And as you know, there really isn’t a perfect time to move. However, the timing was perfect. We are at a juncture in our lives where retirement is looming ever closer, and trying to decide where we would ultimately want to be. Travel, research and soul-searching led us to Bend. The Wikipedia version: Bend has a population of 86,500. It is high-desert at an elevation of 4,000, and very dry. It is named for the sawmill which is at the “bend” of the Deschutes River. We are surrounded by pines, junipers, and spruces and live at the foot of Pilot Butte, an extinct volcano. In fact Bend, is one of only four cities in the US to have a volcano within its boundaries. 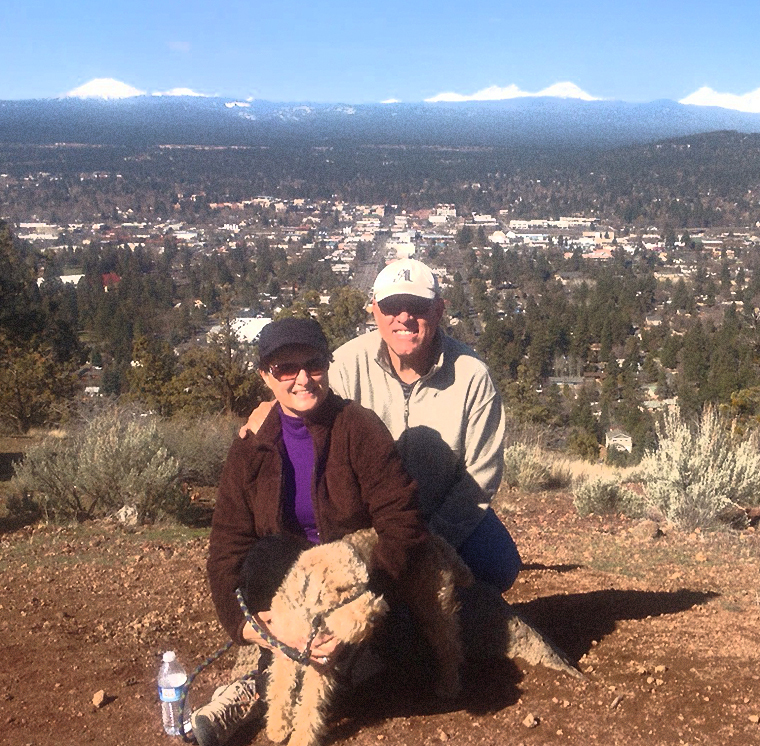 From Pilot Butte, you get a 360 degree view of the entire city, the cascades and on a clear day, you can see Mt. Hood which is 93 miles away. Outdoor recreation is big business in Central Oregon. There are approximately 30+ sporting goods stores in Bend, most of them with a specialty. Yes, an entire store devoted to fly fishing! With Mt. Bachelor just 20 minutes away, you can literally ski, kayak and fly fish all in the same day. May is BEER month in Bend. Craft breweries are another big business with 18 in Bend alone. When my son visited recently, it was his personal mission to visit all 18 in one weekend. I think we made it to four. Supermarkets have “growler” rooms—you can fill ‘er up with a local brew. And Oregon just passed a law that will also make wine and hard cider available on tap. I am most excited about the farm-to-table movement here—local restaurants using local ingredients. The farmers’ markets will be open soon with berries and local honey currently in season. I have fresh eggs delivered to my front door weekly—organic with no hormones. These eggs have a dark yellow yolk and the shells are much more fragile. There is a goat cheese farm in nearby Tumalo. This is still rancher country–complete with a rodeo and bull-riding competition this weekend. Some Oregon perks: Gas is 30 cents cheaper per gallon and you are not permitted to pump your own gas. It’s a law! Registering a vehicle is much cheaper—my Jeep purchase would have cost $3,000 in registration and taxes in California. In Oregon it was $300. There is no state tax in Oregon! Yippee! We bought a home built in 1966 on .5 acres with 47 trees and A LOT of deferred maintenance. 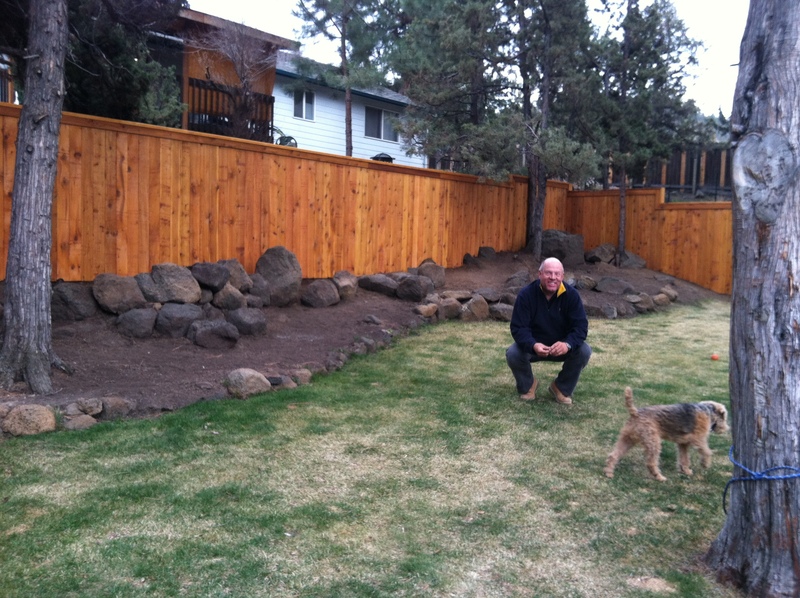 To date we have–installed a new HVAC system, water heater, and fence. Side note–the fence was built by a Michel Guergan, Frenchman who represented France in the Munich and Montreal Olympics in the Modern Pentathlon. In addition to building decks and fences, he teaches fencing (with a foil) at the local college. He is considered a “Master” and has students from all over the world. We’ve become good friends and his wife, Libby, a travelling veternarian, and I will be taking golf lessons. Golf courses are as plentiful here as McDonald’s in California. Next on the agenda will be gutting the kitchen, bathrooms, and refinishing the hardwood floors. Having just missed the local election, we realized that we are not yet registered to vote. And I’ll need to take a drivers test’ for an Oregon license…..oh goodie. Lovely post! Thank you for including me. I am thrilled for you, Cheryl! Loved reading your post, and so happy that you are able to live in beautiful Oregon!! Keep writing! Cheryl, good to hear from you. I am glad to see you are happy and moving on. Have spent a lot of time in Oregon myself, as my sister lived in Eugene. Hope your life continues to prosper!